Link your SuperDoctors.com profile page to your own website or blog with a personalized complimentary badge. Viewers will be directed to your SuperDoctors.com profile, where they can review available information about you. 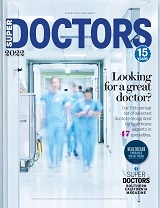 We offer the SuperDoctors.com badge in two sizes, 120 pixels wide and 150 pixels wide. Please note: This is a personalized badge for Sharon R. Baratz. How to add the SuperDoctors.com badge on your site. Highlight and select ALL the code from the desired badge below. Copy (Ctrl-c) and paste (Ctrl-v) the code into your Web page.